It is Early January. You are splitboarding in total silence under magical northern lights. The northern lights are so strong that it is almost scary. You stop and look at the sky. Northern lights are dancing in the sky and you see all those million stars and the moon making the best art which man can see. With total silence, just you and your best friends, with no one else around, the mountains are all yours. It is March. The sea and the fjords are making a beautiful contrast to the white mountains. You are still smiling because you just took a run with a big amount of vertical meters in knee deep powder and with views as if they were taken straight from the Lord of Rings movies. And just when you were thinking that this can’t be any better, you hear a “BIG SPLASH!” from the sea. You look around and see whales hunting fish and blowing water into the air. What the he.. is happening! It is June. You are hiking up a couloir in the middle of the night. The never resting sun is still shining and making spectacular colours to the sky. The sea is totally still and you can see mirror images of the mountains reflected in the sea. Another perfect run is coming up. It is special. It can be magical. And it is definitely worth a visit if you are a splitboarder. Like living legend Seth Morrison once said, “Alaska is skier’s Mecca, but Lyngen is the skier’s heaven". This place can really be heavenly sometimes, even if the powder days are not usually like powder days in Mt. Baker or Japan. But when it is good, it is REALLY good, in all aspects of snowboarding: views, snow, mountains, nature, people and atmosphere. This place is unique. Troms County has many islands and half of the biggest islands in Norway. The second biggest island in Norway is Senja, located a 2,5 hour drive from Tromsø. The fifth and sixth biggest islands Kvaløya and Ringvassøya are also in Troms. Both islands are about 30 minutes drive from Tromsø. The highest peak in Troms, located on the Lyngen peninsula, is called Jiehkkivarri and is 1883 meters high. All together Troms has 666 peaks over 1000 meters and I don’t even know how many under thousand meters there are, but I know that there are enough mountains to hike for a lifetime, or two… Even though the mountains are not so high here, they are very competitive to mountains in the Alps. In Troms peaks often rise straight from sea level or at least close to. According to Chamonix veterans, Lyngen is in many ways better than Chamonix from a touring perspective. Troms has excellent terrain with everything from mellow open fields to super steep chutes and faces. The nature is beautiful and there is a peacefulness that is hard to find in other places. You can easily find excellent snowboarding whether you are an expert or novice. It is just to explore, use imagination and go for it. It is not rare to find couloirs that go straight to the sea or places where you can shred straight to the beach stones. It is special and it gives a whole new beautiful aspect to splitboarding. Tree skiing can also be good, but tree level is usually at 600 meters and trees are small and often more like bushes. So it can be hard to find good tree skiing, but it is possible. Locals know the spots, but often keep it in secret. Troms can’t compete in snow amounts places like Mt. Baker or Japan recieve. But when the best season is on, February to April, you can easily find yourself riding knee deep powder. And sometimes even waist deep, but that is rare and usually found at higher elevations. The snow often arrives to Troms with high winds, which makes it more compact and increases the avalanche risk. So that is good to keep in mind. The easiest way to come here is probably to first take a flight to Tromsø, and after that you have different options to choose from. I would recommend you to rent a car or a RV, because bus connections are often quite bad or none existing. “Where to go?” is another really good question. A good and hard question in a positive way, because there are so many places to choose from. Most people go to Lyngen because it is the most famous place with the biggest mountains. But you can also find other really nice and not so crowded places, even though “crowded” in Lyngen is nothing compared to the Alps. You can often easily find untouched powder here as well, if you are not choosing the most popular lines. One cool place to go is the Tamok valley, which is really popular amongst Finnish riders, like pro rider Antti Autti. The place is about one and a half hour drive from Tromsø. Tamok is especially good choice if Lyngen and other coastline locations are getting mild weather. The Tamok valley has continental climate and is located at about 200 meters altitude, so the weather is often colder and more stable. The mountains in the area are big and you can find many gnarly lines, but it is also easy to find mellow powder lines. Many hikes start and end right at your car door. Kvaløya is another good option. It is a big island west of Tromsø. 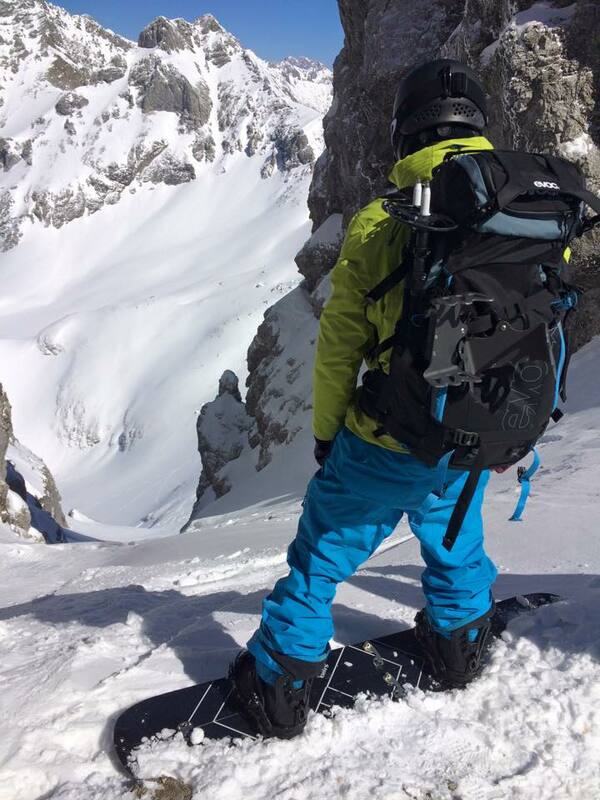 It offers good splitboarding, even though the mountains are not so high. “Mini Alps” like my friend likes to call Kvaløya's mountains. The peaks here are around 1000 meters high, but when they start from sea level you can get plenty of vertical metres in one run. You can find lines for experienced and less experienced riders. Hiking is also from door-to-door like in Tamok. Senja is another big and beautiful island southwest of Tromsø, which can be a really good choice. It has the same kind of “mini alp” terrain like Kvaløya. And we can’t forget Lofoten. It is about 7 hours drive from Tromsø, but it is well worth a visit. The place is absolutely mind-blowing and maybe the most beautiful place I have ever been to. But Lofoten is really exposed to sea weather, so I don’t recommend it as an headquarter if you are travelling from far away. But when the snow and weather is good, that place is amazing. You also find nice surf spots in Lofoten if the weather gets stormy. And then there is this place called Narvik, which has a lot of good splitboarding opportunities. Narvik also has a good ski resort, which unfortunately often is exposed to sea weather. In Troms you can go touring about 8 months a year, but the best time to come here is between February and May. And the two best months are March and April. Polar nights begin from end of November and the sun comes back around mid January. So in that time it is quite dark. It is possible to use headlamps, but you should have local knowledge. If the weather is clear you can have polar nights “blue light” about 2-3 hours. It is special to go touring in “dark times”, but then the reason to go touring is more learning to experience something different, rather than enjoying technical ascents and descents. The snow starts to get a bit more affected by the sun in mid April, and snow conditions are often stable in that time, if you are moving at the right time of day. April temperatures in Tromsø are like February temperatures in the Alps. Or something close to that. Unfortunately Troms County has had a lot of avalanche victims in the last years. Actually the most in Norway. So check Norwegian avalanche forecast from here: www.varsom.no and use local guides. In my opinion, local knowledge is especially important when you are touring in Northern Norway. Well from splitboarders perspective I would say RV or car is the best choice. Bus connections are bad in here, so car is the best choice. If you don’t need luxury, tent and some “rent a wreck car” should work, if you are heading here during “the warm months” of March, April or May. But if you are camping, just remember to ask the landowners for permission. Especially if you are camping close to houses. Of course you can also stay in a camping area or ski lodge, if your budget allows. Is Norway the right place for me? Well if you like silence, non crowded places and pure and unique nature this is the place for you. If you like to use lifts every once in a while, this not the place for you. In Norway you don’t have to worry about snowmobiles and helicopters, because it is almost totally forbidden to use motor vehicles in nature. Well, until now. I just heard that the new government is giving power to the counties to decide where and when you can use snowmobile and helicopter. I hope it doesn’t get too crazy. In Northern Norway you can really have world-class splitboarding in a very special environment. And yes people are nice and helpful here, so what else do you need to know? Just fly here, open your eyes, dream it, and do it. Copyright by Juha Tolvanen / Sponsor Furberg Snowboards. All pictures by Juha Tolvanen. Don`t miss the video from November in Nothern Norway. 3. January 2014 - 13:18— Log in or sign up to post comments. Super Artikel mit guten Infos. Ich war im Mai/Juni 2012 in Nordnorwegen und hab immer Ausschau nach Colouirs und co gehalten. Zu der Zeit sind dort echt noch gute Tourenbedingungen. Des wär echt n Traum wenn ich nochmal nach Norwegen zum Splitboarden komm! 3. January 2014 - 9:00— Log in or sign up to post comments. 8. January 2014 - 22:57— Log in or sign up to post comments. 14. July 2014 - 17:45— Log in or sign up to post comments. 9. January 2014 - 14:52— Log in or sign up to post comments. 3000 km für München - Tromso??? wo immer uns der Camper bingt. Hört sich zwar nach langer Fahrt aber wahnsinnig viel Spaß an. 18. December 2016 - 20:19— Log in or sign up to post comments. Some friends and I are organising a winter trip this coming season to Norway and we are looking for a splitboard rental place to hire equipment. I've looked over the internet with no luck. Would anyone have any advise or pointer as to where splitboards can be rented? 13. January 2014 - 22:13— Log in or sign up to post comments. Hammer Gegend, ein Freund von mir war letztes Jahr dort und hat ein Video gemacht. Wer nicht nach dem Artikel überzeugt ist, der will nach dem Video sofort los ins Paradies!